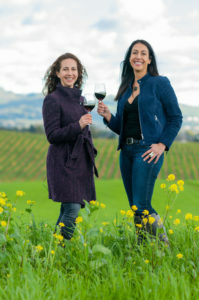 March 27, 2019, (Napa, Calif.) – More than 35 years after Tony and Herta Peju founded Peju Province Winery in Rutherford, daughters Lisa and Ariana Peju are opening Calmére Estate Winery and tasting room in the Carneros region of Napa Valley. In 2016 the Peju family purchased the 100-acre estate and winery and this spring have re-launched the property as Calmére Estate Winery. The winery’s official grand opening will be celebrated on Friday, March 29 with a group of trade and consumers. Lisa Peju will saber a bottle of sparkling wine and Supervisor Brad Wagenknecht will make a few remarks. The winery is located at 2750 Las Amigas Road (Napa 94559), approximately a 45-minute drive from the Golden Gate Bridge. “The name Calmére (pronounced ‘cahlm-air’) comes from the French words for calm (calme) and sea (mer), reflecting our serene location and spectacular views of San Francisco Bay,” explains Lisa Peju. 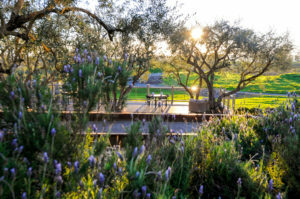 “We are eager to welcome guests who can enjoy their tasting amongst the olive trees which frame our expansive deck with its romantic views of the rolling Carneros hills,” she added. 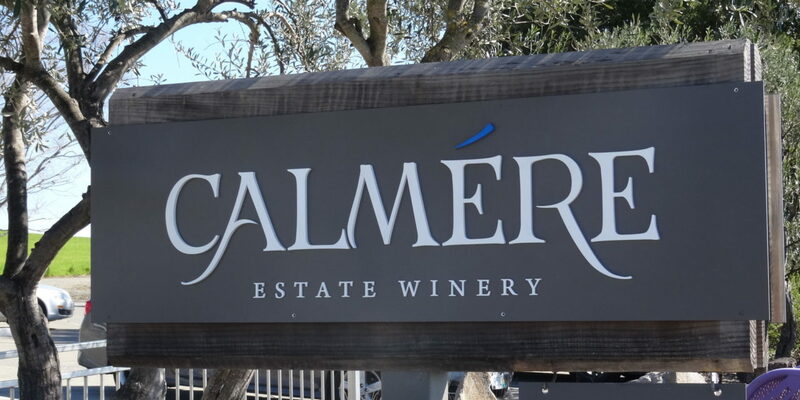 “Our vision for Calmére Estate Winery is to produce exceptional Burgundian varietals that are ideally suited to the growing conditions in Carneros,” says winemaker Sara Fowler. “We have 38 acres here planted with 9 different Pinot Noir clonal varietals: Acacia, Martini, Mt. 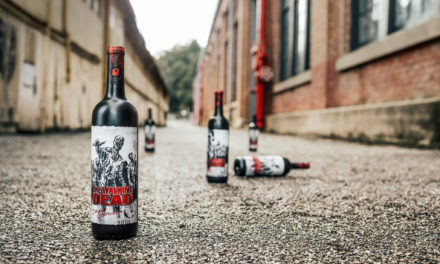 Eden, Swan, Hansel, Pommard, Clone 115, Clone 667 and Clone 777, which offer us the perfect recipe for truly memorable and delicious wines,” she added. The Calmére seated tasting experience features up to five wines and takes place in the tasting room or outside on the terrace. The tasting room was designed by Ariana Peju working collaboratively with designer Lauren Pique. “We sought out not only beautiful touches but also ones which were memorable and unique to us,” Ariana explains. 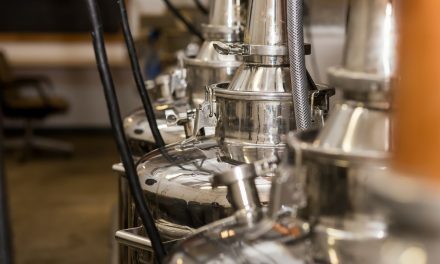 “The tasting room incorporates, for example, antique glass wine containers as lighting fixtures and reclaimed wood paneling from an oak tree on our family’s Persephone Ranch vineyard,” she added. Private member tastings are hosted in the second floor Club Calmére lounge that features incredible views from the floor to ceiling glass doors that open out onto a private balcony. Soft seating, accent pieces and distressed wooden walls of the lounge are a natural extension of the details from the first floor tasting room. 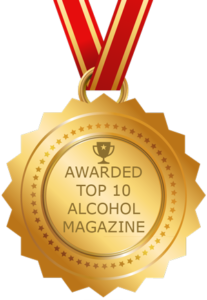 Current wines include Chardonnay ($30), and Reserve Chardonnay ($55) from Napa Valley and from Carneros Rosé of Pinot Noir ($30), Pinot Noir ($45), Reserve Pinot Noir ($65), Clone Pommard Pinot Noir ($75), Clone 667 Pinot Noir, Vintner’s White Blend ($30), Viognier ($30) and Vintner’s Red Blend ($45). The winery is open by reservation only. The tasting room is open daily from 10:00 a.m. to 4:30 p.m. For more information, please visit: www.CalmereEstate.com or call 707/302-1160. Founded in 1983 in Rutherford by Tony and Herta Peju, Peju Province Winery owns 515 acres of estate vineyards in Rutherford, Oak Knoll, Carneros, Calistoga and Pope Valley which are organically and sustainably farmed. 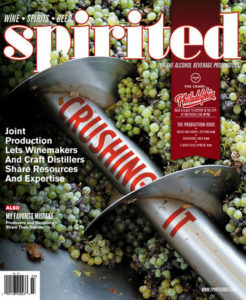 Still family owned and operated, the business has transformed over the past 37 years from a simple grape growing venture into a landmark winery. Today the winery is home to lush gardens, distinctive architecture and a tasting room offering world-class hospitality. 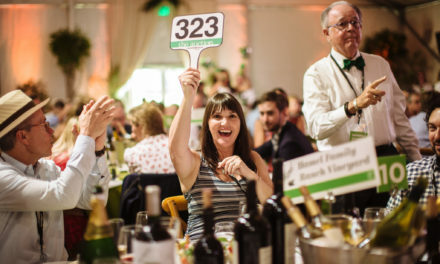 Winemaker Sara Fowler directs the production of Sauvignon Blanc, Cabernet Sauvignon, Merlot, Cabernet Franc, Syrah, Petit Verdot, a dessert Zinfandel, a Dry Rosé and proprietary wines including Province, The Experiment, Sketches, Piccolo red blend and Fifty/Fifty red blend. More: http://www.peju.com/ .